Here’s another interesting grave that I didn’t have room to include in my book Lancashire: Who Lies Beneath? 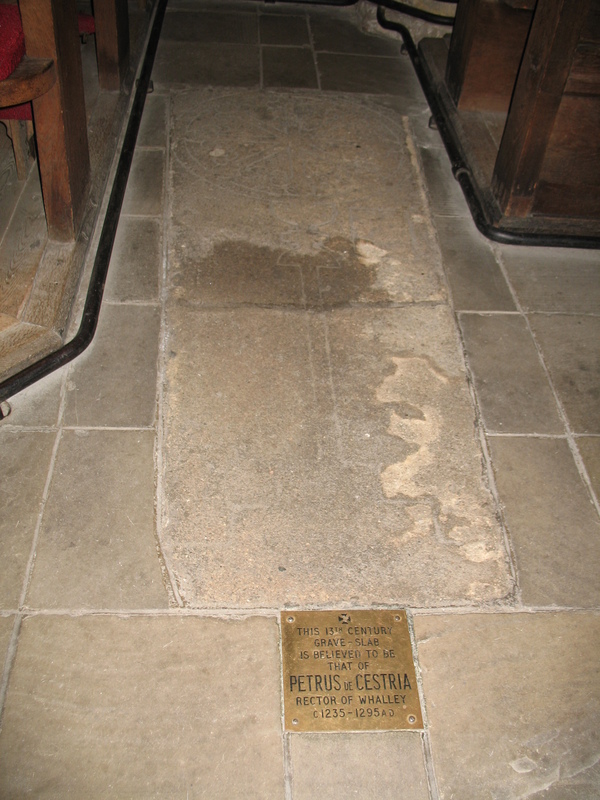 It is not the actual grave but the gravestone of Peter de Cestria, the first and only Rector of Whalley. It previously lay in the churchyard but was brought inside in 1950 to preserve it. Peter de Cestria was an interesting man and a member, though not a legitimate one, of the de Lacy family. He was never actually a priest but rose to become a very influential man in the reign of King Edward I. Although the remains of Whalley Abbey contain his chapel, that building pre-dates the abbey and Peter was set against the monks making the move from Stanlaw. They were only able to come after his death, eleven years after they had been promised the site by Henry de Lacy. I’ve written more about Peter de Cestria on my page about the de Lacy family.